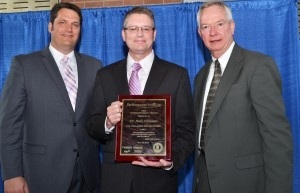 ALTON - The Illinois Chiropractic Society has announced Rosewood Chiropractic Clinic's Dr. Andrew Dykeman as the recipient of its 2012 President's Award. Born and raised in Alton, Dykeman attended Logan School of Chiropractic and operates Rosewood Chiropractic Clinic in East Alton. He also is vice president of the Illinois Chiropractic Society Board of Directors and is the alternate delegate of Illinois for the American Chiropractic Association. The Logan College Alumni Association held their annual awards ceremony on June 23rd, 2012 when Dr. Andy Dykeman was the recipient of the 2012 Biofreeze Humanitarian Award. After years touring in pop punk band "Judge Nothing,” Dr. Dykeman graduated from Logan College of Chiropractic and began practice in East Alton, Illinois at Rosewood Chiropractic Clinic. Because of his clear interest in music as well as his involvement in his community through volunteerism and The Wood River Rotary club, Dr. Dykeman became involved with the "Delta Regiment," a youth drum corps created to provide struggling young people guidance, discipline, self-esteem and a positive way to express themselves. Through his contacts developed with "Judge Nothing," our honoree collected over two truckloads of drum equipment for donation to the "Delta Regiment." Additionally, he maintains involvement with the corps by making time for health and wellness instruction and providing his office as a platform for some of the group's performances. The Biofreeze Humanitarian Award includes not only this public recognition, but also a donation to the "Delta Regiment" from Biofreeze.